Be sure to check back early and often over the next several days, as this page will provide a running blog of notes, features and highlights from all of the events that are part of the Perfect Game All-American Classic presented by Rawlings. You can also follow updates via Twitter and Facebook and view photos of the event on Flickr. Congratulations to outfielder Ryan Boldt of the West team for being named the MVP of this year's Perfect Game All-American Classic presented by Rawlings. Boldt went 2-for-3 in the game with a triple. "This was just a dream come true," Boldt said after the game. "It was just a great opportunity to be able to come out and play with all these great players. It was a lot of fun down here, first of all, and you've got to have fun at these kind of events. Hanging out with the guys has just really been a good time." Stay tuned to for a full game recap and box score. Tonight's attendance is 7.638. Thanks to everyone who made it out to PETCO Park this evening to take in the 2012 Perfect Game All-American Classic presented by Rawlings. It's not uncommon -- in fact, it's expected -- for the local San Diego prospects playing in the annual Perfect Game All-American Classic presented by Rawlings to bring a large following of family, friends and fans into PETCO Park. Standout left-handed pitching prospect Robert Kaminsky from Englewood Cliffs, N.J., didn't exactly have dozens of supporters in the seats for Sunday night's 10th annual All-American Classic, but he had enough hometown support for at least one PG blogger to take note and, as it turns out, this wasn't a one-time thing. Kaminsky, the nation's No. 4-ranked overall prospect and No. 1-ranked left-hander, has been joined in his travels this summer not only by his parents, Alan and Donna, and a brother and sister, but also by close friends of his and his siblings. These friends have traveled from coast-to-coast to show their support for Kaminsky, who on Saturday night was awarded the 2012 Baseball America Pitcher of the Year at the PG AA Classic's awards dinner. "My house is different than any other house in town, I'll tell you that. Our house has like a revolving door," Kaminsky explained to me about two hours before he was to be the East Team's starting pitcher in the PG All-American Classic. "My mom (Donna) is awesome -- she's always cooking -- and I've got a (high school) baseball field in my backyard; I live right behind left field," he said. "We're always out there playing ball ... and it seems like we always have seven or eight people over -- my friends, my brother's friends, my sister's friends. It's a real revolving door." So, four of Kaminsky's close friends spun out of that revolving door and have been traveling with the Kaminsky family to some of the tournament's Robert has pitched in. Vincent Spoleti, Ethan Rosler, Austin Coiro and Eric Schauer are with the family's traveling party in San Diego this weekend. "They're always with me and they've always supported me," Kaminsky said. "It's like they're not even friends right now, it's like they're family; we're more of a family. We grew up together and we've stuck together." Kaminsky said he has been friends with this core group for more than 10 years, even though they're not all in the same graduating class. The group started this summer out by following Kaminsky to the USA Baseball Tournament of Stars in Cary, N.C., in late June and made another trip to Cary after Kaminsky made the USA Baseball 18U National Team. 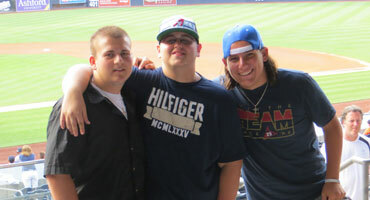 Their next trip was to Marietta, Ga., to watch Kaminsky pitch for the Tri-State Arsenal Blue at the PG WWBA 2013 Grads or 17u National Championship the second week of July. They next flew from their Jersey homes to southern California last Wednesday, hung out in LA for a few days and then drove down here. "We do it because we're all best friends with Rob and we love to support him," Spoleti said from his seat in PETCO about a half-hour before Kaminsky delivered the first pitch. "We want the best for him, so that's why we do it." "It's just been crazy. You meet so many cool people," Coiro chimed in. "We're all at the (Kaminsky) house all the time with Rob, and it's like a big family; wherever he goes we go with him. We're experiencing the same things that he's experiencing and it's awesome." Coiro graduated from high school in 2012, Rosler is with Kaminsky in the class of 2013 and Spoleti is in the class of 2014. Schauer wasn't available when I was in the stands talking to the young men. "This whole summer has been great the way everything progressed and also the way Rob's progressed throughout the whole summer," Rosler said. "We've been hanging around with him for so many years I can't even go back to when we weren't with him during the summer. It's been a cool experience." The traveling party is likely to be broken up next spring when Kaminsky is expected to be a first round selection in the 2013 MLB amateur draft. Then again, that would only create more opportunities for the travelers from New Jersey. Next summer might be spent visiting minor league parks. And who knows? A few years down the road they might be returning to PETCO to watch Kaminsky pitch in the big leagues. As the 2012 Perfect Game All-American Classic presented by Rawlings is about to begin, with the first pitch scheduled to be thrown at 6:08 PDT, I have been informed that there are over 200 scouts in attendance. 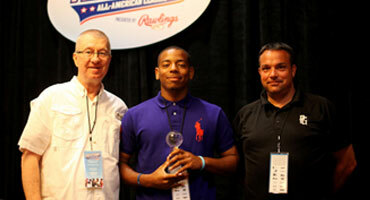 The East's Justin Williams won the 2012 Rawlings Home Run Challenge by slamming four blasts in the final round. With zero home runs and only four outs to go, three of his East teammates (Nick Ciuffo, Oscar Mercado and Chris Okey) came out, rubbed him down and took off his sunglasses while offering words of encouragement. After the pep talk Williams proceeded to hit his four homers. "They took the glasses and I kind of got serious," Williams said. "I was like, 'All right, I really have to focus now; no more joking around.' Once you hit two or three, then you're like, 'OK, relax.' Then you try to follow up with the same routine every time, and once you get in a rhythm it's hard to break it." Clint Frazier was the only other participant to hit a home run in the challenge, as PETCO Park proved to be particularly tough on the sluggers this afternoon. Frazier's sole dinger was an impressive blast, and he also hit a shot off of the 401 sign on the wall in left-center. Williams hit nine home runs in the first round of the Rawlings Home Run Challenge on Saturday conducted at Point Loma Nazarene University. Reese McGuire led all of the participants with 10 home runs in the opening round, followed by Williams and Cavan Biggio (8). Kevin Franklin, Clint Frazier and Rowdy Tellez were also added to the challenge finals as wild cards. RHP Jordan Sheffield (East) is not allowed to participate in the game due to Tennessee high school association rules. OF Dane McFarland (West) is not able to participate in any baseball-related activities due to a right shoulder injury sustained last month as chronicled by PG intern Nick Kappel. It's difficult to imagine any sports venue in the country making a better first impression than the Padre's PETCO Park in the heart of downtown San Diego makes on a warm and sunny Sunday afternoon in mid-August. 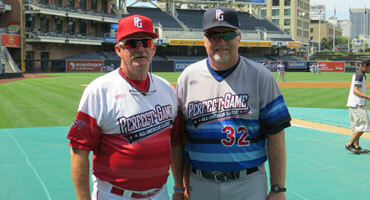 You know the park sells itself when two veteran, hall of fame high school coaching legends, two guys with more than 1,400 wins in a combined 71 seasons, two guys who were hand-picked this year to be the head coaches of the East and West squads at the Perfect Game All-American Classic presented by Rawlings are among the most impressed. But here they are, East Team head coach Clyde Metcalf from Sarasota (Fla.) High School and West Team head man Marc Johnson from Cherry Creek (Colo.) High School, taken in by PETCO's grandeur. "The setting is amazing," Metcalf said, looking out at the field from the area around home plate. "It's a cool feeling as an adult or a coach to walk through that (tunnel) and you watch the kids walking in front of you and the way they react when they walk into the park. It's a good feeling. "Some of these guys will be playing on fields like this (on a regular basis) someday but today it's a tremendous thrill for them." "This is an absolutely awesome venue and the entire program that Perfect Game puts on is absolutely first class," he said. "The venue at a major league ball park in San Diego is literally unbeatable. I've been able to be in most of the ballparks in the country, and this is a great one. Tremendous setting, tremendous weather and the kids couldn't be any more excited to play on it." I wanted to grab Metcalf and Johnson right off the bat Sunday afternoon to get their impression not just of PETCO but also of what the last four days have been like for them being a part of the PG All-American Classic. Some background on the two probably isn't necessary, but here goes. Metcalf owns a 31-year head coaching record of 761-205 at Sarasota High and has won six state championships - all in Florida's big-school classification - with three more runner-up finishes. Sarasota HS was awarded mythical national championships in 1989 and 1994 under Metcalf and has produced eight first round MLB draft picks. Metcalf, who has also been Sarasota High's athletic director for the past 20 years, has been named national high school coach of the year three times and was inducted into the Florida Athletic Coaches Association Hall of Fame in 2010. Johnson is a card-carrying legend in the Colorado high school sports community. He entered his 40th season in 2012, he’s coached Cherry Creek baseball teams to seven state championships, including five straight from 1995-99. He also led Bruins’ teams to five state runner-up finishes, the most recent just last season (2011). Twenty-six league championships are also on his resume. He owns an overall record of 673-158 after 40 seasons at Cherry Creek. In 1997 alone he was named the National High School Coach of the Year by the American Baseball Coaches Association, the National American Amateur Congress Baseball Coach of the Year and the head coach of the American Amateur Baseball Congress National All-Star Team. He’s coached in the USA Junior Olympics three times and in 2000 was named the “National Coach of the Decade of the ‘90s” by Baseball America. Johnson was also the boys’ soccer coach at Cherry Creek for 25 years and won five state championships; last year he was inducted into the Colorado High School Activities Association Hall of Fame. Johnson has also worked as a professional scout for 30 years and is currently employed by the Colorado Rockies. Despite those legendary accomplishments, both men spoke of their experiences here over the last four days as a definite career high-point. "In coaching, you always look for that new experience and this is the first time I've experienced something like this," Metcalf told me Sunday afternoon. "To able to be around kids like this -- and that's what it's about is these young men -- it really makes you feel good about what you're doing. It puts a stamp on what you're trying to do and it's been a thrill for me and it's something that I'll never forget." Johnson has experienced just about everything a high school coach in this country can experience. This is just another adventure. "There's excitement among the coaching staff let alone the young players," Johnson said on Sunday. "This is an honor for everybody ... and it's a very first-class situation. I would recommend it to anybody that is selected for that opportunity." At age 67, Johnson shows no signs of slowing down. He and Metcalf both interact with the young high school seniors extremely well, and Johnson, who retired from teaching more than 10 years ago, has no plans of retiring from coaching anytime soon. Heck, his 2012 Cherry Creek team won the big-school Colorado state championship so he's not about to walk away at this point. It's what keeps him going. "People are surprised when I tell them how old I am because the kids at this age are so much fun and so lively and so vibrant, you just can't help but stay young with them because they're just having too much fun doing what they're doing," he said. "It's been an honor and a treat for me coach that long and certainly to be at this venue for this game." The players have arrived at PETCO for a series of warmups and a round of BP. These workouts will go until 3:50 pm PDT, followed by a snack and then the final round of the Rawlings Home Run Challenge which begins at 5:00 pm. 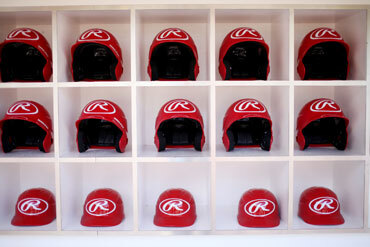 Our good friends at Rawlings have also provided the batting helmets the players will wear during the game, with the red West team's helmets shown in the picture above. Game day is upon us. As the players have been spending the last several days leading up to today practicing, scrimmaging, visiting Rady Children's Hospital, the Miramar Marine Base and participating in last night's award dinner banquet, they have been spending time together while getting to know one another and forming life long bonds. That camaraderie culminates in competition as today at 6:00 pm PDT the broadcast will begin on CBS Sports with a 6:08 pm first pitch. For those attending in person, the gates at PETCO will open at 2:00 pm, and the players will participate in a light workout leading up to the final round of the Rawlings Home Run Challenge. Reese McGuire, Justin Williams and Cavan Biggio already advanced to the finals after hitting 10, 9 and 8 home runs respectively during the first round of the challenge yesterday, while Kevin Franklin, Clint Frazier and Rowdy Tellez were voted in as wild cards. Tellez won the Rawlings Home Run Challenge at the PG National Showcase at the Metrodome in mid-June with Frazier coming in second, while Franklin put on an impressive display of power during batting practice yesterday. The final round of the Rawlings Home Run Challenge will begin at 5:00 pm PDT. Be sure to continue to follow us on Facebook and Twitter as linked above, as well as the event's Flickr page for photos. You can watch the Selection Show which aired on CBS Sports on July 12 here, and last night's awards dinner banquet here. Stayed tuned throughout the rest of today for updates and features from the 2012 Perfect Game All-American Classic presented by Rawlings. The carrot-topped kid from Loganville, Ga., who is as humble as he is talented and has already drawn comparisons to MLB All-Stars Mike Trout, Bryce Harper and Justin Upton, stole the show Saturday night at the Perfect Game All-American Classic presented by Rawlings Awards Dinner. 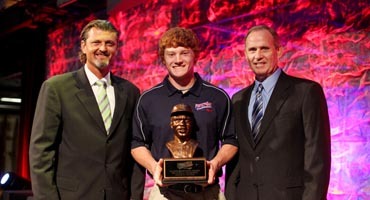 With banquet Master of Ceremonies Daron Sutton making the announcement and event Honorary Chairman Trevor Hoffman handing off the hardware, top-ranked 2013 prospect Clint Frazier from Loganville received the Jackie Robinson Award given annually to the Perfect Game National Player of the Year. Frazier, a 6-foot-1, 190-pound five-tool prospect who has verbally committed to the University of Georgia, won the prestigious award in front of five other finalists: Los Angeles 1B/OF Dominic Smith; Englewood Cliffs, N.J., LHP Robert Kaminsky; Houma, La., OF Justin Williams; Pembroke Pines, Fla., C Zack Collins; and Houston, Texas, INF Cavan Biggio. "It means a lot just for y'all to nominate me for the best high school player this year," Frazier said after walking off the stage at the San Diego Hall of Champions where the Awards Dinner was held. "Just being one of the six guys up there really means a lot and it shows what I've been doing wasn't being taken for granted, and what I've been doing really means a lot." Smith was named the New Balance Prospect of the Year; Biggio was given the EvoShield SWAG Award; Kaminsky received Baseball America Pitcher of the Year honors; Oscar Mercado (SS, Tampa, Fla.) was given the Rawlings Defensive Player of the Year award; and Puerto Rican infielder Jan Hernandez received the coveted Perfect Game Nick Adenhart Award. Frazier hit .431 with 24 home runs and 61 RBI his junior season at Loganville High School, but it wasn't until his performance at the Perfect Game National Showcase in Minneapolis in mid-June that he rose to the No. 1 spot in the national rankings. At that event, Frazier ran a 6.42-second 60-yard dash, threw 98 mph from the outfield and finished second in the Rawlings Home Run challenge to fellow PG All-American 1B/OF Ryan "Rowdy" Tellez. Although still just 17 years old, Frazier has spent a brief lifetime climbing to the top of the mountain. "Hours and hours and hours of practice and getting up and working out early in the morning to try to beat the competition," Frazier said of his key to success. "Not being complacent about where I am and wanting to get better every single day, and giving all the glory to my coaches, my family and my friends." Frazier, who played this summer with Team Elite, said Saturday night that he is working on his leadership skills but his humble nature will always make everyone else around him better. "I'm not much of a verbal leader but I try to lead by example on and off the field," Frazier said before reflecting on the three days he's spent in San Diego with one more big one to come on Sunday. "This is definitely something I will remember the rest of my life." The Awards Dinner was a rousing success thanks to a can't-lose combination of great food and great speakers. Hoffman spoke eloquently, as is always the case, and the guy who is second all-time in career saves at the MLB level reminded this year's All-Americans of the responsibilities they must honor. "When I think of 'save' I think of selflessness; it isn't thinking less of yourself but about yourself less," Hoffman said. "If you think about it in a context like that, if you think about yourself less it can really bring the whole group together." On Friday afternoon, more than 24 hours before the Awards Dinner, Hoffman offered his thoughts on the Classic to Perfect Game while visiting the Rady Children's hospital. "We all know the history with where these kids get drafted at -- a lot of them are first-rounders -- and the quality of play in this game is tremendous," he said. "We're going to see these guys on TV, we're going to see them doing the wonderful things that they do on a baseball field, and to have the opportunity to see them at this level and at this age is pretty neat. "I would tell them to really enjoy the process," he concluded. "Respect the game, respect your teammates, and in doing so I think the love of the game will come out in a lot of these guys. At the end of the day it's not really work, it's really a lot of fun." 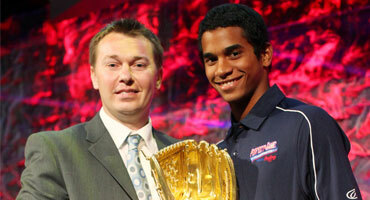 Oscar Mercado receives the Rawlings Defensive Player of the Year Award from Rawlings' Mark Kraemer. As noted below, the annual award banquet was streamed online and the archive is available to be viewed by following this link. You can also visit the iHigh Perfect Game page. Congratulations to these young men and all of the players selected to participate in the 2012 Perfect Game All-American Classic presented by Rawlings. Visit the event's Flickr page to see pictures of all of tonight's award winners. The Perfect Game All-Americans filed out into a back parking lot at the San Diego Marriott Mission Valley hotel and first set sights on two large pieces of motorized equipment that in some ways rivaled what they had seen the day before at the Marine Corp Air Station Miramar. There was what most accurately can be described as a Monster Truck, a big-wheeled, high-sitting pickup truck that hauls a trailer known as the Oakley Mobile Lab, a demonstration laboratory on wheels that was sitting adjacent to the hauler. The Oakley, Inc., vehicles were on hand Saturday afternoon to exhibit for the All-Americans the optical and safety features of Oakley eyewear by taking them inside the mobile lab and conducting tests for the prospects to witness first-hand. Aaron Lombard, who works in North American Marketing for Oakley, conducted the demonstrations for small groups of All-Americans, 14 at a time. "With baseball, we have a huge presence in the game, in the industry. Everything from the major leagues all the way down to the little leagues, Oakley has a presence," Lombard told me after the first group had passed through the lab. "So when you're talking about the future stars of the game, it just makes sense for us to partner-up with Perfect Game. "They've got a real good thing going with these young kids and with the future, and we try to stay ahead of the curve with everything we do." Inside the lab, Lombard demonstrated how Oakley eyewear is designed to provide optimum optical efficiency that lessens eye strain, and also how the company uses specific compounds and design techniques that enhance safety. "There's more to sunglasses than just blocking the sun," Lombard said. "We want to make sure that this is a sports performance piece and we want (the athletes) to understand why they're wearing it." After the tour, each All-American was given a gift bag and was given the opportunity to select from a variety of frame and lens styles and colors to assemble and personalize their own set of shades. When All-American Gosuke Katoh from nearby Poway, Calif., asked for a mirror, Oakley national director of sales Chris Long got one out of the lab, noting that "These guys like to look good, too." Not missing beat, Katoh quickly replied, "Isn't that all that matters?" No, Gosuke, safety and performance matter, too. "One day, these guys are going to be in the big leagues and if we can tell our story and get a hold of them and show them that there is a difference in eyewear, there's a difference in what you're wearing from a performance standpoint and that it makes sense to wear Oakleys," Lombard said. Oakley jumped on board as a Perfect Game All-American Classic presented by Rawlings sponsor this year, and Lombard thinks the two companies make great business partners. "Just with the excellence that they've shown with what they're trying to do with these athletes, and us being a technology-driven company striving to be the best all of the time, it's just the perfect storm for the perfect game, if you will," he said with a laugh. As is often the case, there are some pretty darn good football players gearing up to play baseball at this year's Perfect Game All-American Classic presented by Rawlings. Elite quarterback prospects Kohl Stewart from Tomball, Texas, and Cord Sandberg from Brandenton, Fla., are perhaps the two most high-profile of the group -- Stewart, a right-hander on the Classic's West Team, has committed to play football at Texas A&M; Sandberg, a lefty on the East Team, has committed to Mississippi State. Both are also projected as high-round picks in June's 2013 MLB amateur draft. Another three-sport star from a small town in Idaho is also likely to have a decision to make after next spring's amateur draft. Joey Martarano, a 6-foot-3, 230-pound quarterback/linebacker, power forward (basketball) and third baseman at Fruitland (Idaho) High School has committed to play football at Boise State, but a promising future on the baseball diamond may alter those plans. The thing is, due largely to the somewhat remote area of the country that Martarano calls home, his national exposure has been limited. The Perfect Game All-American Classic will be the first PG-sponsored event at which he's participated, but PG scouts still rank him as the No. 39 national prospect in the 2013 class. "I haven't ever done any of the Perfect Game deals and stuff, but this is really cool," Martarano said Saturday morning before taking BP at Carroll B. Land field at Point Loma Nazarene University, overlooking the Pacific Ocean. "I was excited when I found out (he had been selected for the Classic) and just want to come out and compete because it's against the best kids in the world." Martarano helped Fruitland High to the Idaho Class 3A state football championship in 2010 and a state runner-up finish in 2011. The Grizzlies have won two straight state basketball championships with Martarano adding bulk on the inside, and he's also led Fruitland to back-to-back state baseball championships. "There are two things that he really possesses -- huge humility and huge competitiveness," Fruitland head baseball coach Russ Wright told idahostatesmen.com in an article published May 17. "And that's a really dangerous combination." Like Stewart and Sandberg, Martarano will likely have a difficult decision to make next spring. He has always kept busy the year-around playing three sports, and if he ever decides to concentrate on just one the results could be impressive. He has made it clear he won't attempt to play both football and baseball in college and probably wouldn't attempt to play college football and professional baseball, although that could be an option. "I've liked (football) every since I was a kid but I'm kind of playing the baseball thing out to see how it pans out in the future," he told me Saturday morning. "I think it definitely could (provide opportunities) if I just go out and play like I can." Today's schedule on the field is rather light, but it does include something the players look forward to each and every year: The Rawlings Home Run Challenge. Round 1 is being conducted today at Point Loma Nazarene University with the finals scheduled for tomorrow at PETCO Park. The left-handed hitters were at an advantage today, as there is a shorter porch in right and the wind blows in from left off of the ocean. The one exception to this was Domingo Ayala, who drove 11 balls out of the park directly into that breeze, a handful of which were hit well into the Pacific. Due to a technicality, Ayala was not eligible to advance. A special congratulations goes to Reese McGuire, Justin Williams and Cavan Biggio, who, along with two wild cards to be selected by the Perfect Game staff, will advance to the Rawlings Home Run Challenge finals. The final round of the Challenge will be conducted tomorrow at 5:00 pm PDT. Bowman and Topps ran a card creative Facebook giveaway promotion on the days leading up to this year's Perfect Game All-American Classic presented by Rawlings. Fans had the opportunity to win autograph cards from previous years; the most recent one to be made available was the one shown above of 2011 PG All-American David Dahl, a 2012 first-round pick that is now a member of the Colorado Rockies organization. Follow Bowman's Facebook page and Topps on Twitter @toppscards. Follow this link to watch the awards banquet online. The dinner banquet is held in conjunction with the Classic every year and several awards are handed out. The awards include Jackie Robinson Award (finalists listed below), the Rawlings Defensive Player of the Year, the New Balance Top Prospect of the Year, the Baseball America Pitcher of the Year, the Perfect Game Nick Adenhart Award and the Evoshield SWAG Award. The visit to San Diego's Rady Children's Hospital left top East Team catching prospect Nick Ciuffo feeling like he was back home in Lexington, S.C. The Perfect Game All-American Classic presented by Rawlings has long donated its gate proceeds to Rady's cancer center. Each year since the event has been held in San Diego -- this is the fourth straight year and sixth overall -- the All-Americans have visited Rady and interacted with its young patients, and each one has left moved or affected in his own special way. Friday's visit sent Ciuffo back home to Lexington, at least in his heart and mind. Back in Lexington, you see, the 14th-ranked overall national prospect (No. 2 at the catcher position) has come to know a 13-year-old girl named Kennedy who has been diagnosed with a rare, incurable form of brain cancer. When Nick walked into one of the courtyards/playgrounds at Rady made available for the All-Americans' visit, his thoughts immediately went out to Kennedy. "Our whole town has basically rallied around her and has just tried to help her as much as we can," Ciuffo said while fetching another toy or puzzle with which he was going to use to engage a young patient at Rady. He explained that on his baseball glove he has written the initials "PFK" which, he said, stands for two things: "Pray for Kennedy" and "Play for Kennedy." "If people go and look at my Twitter account, anytime I tweet about going to Perfect Game (events) or anything like that, I tweet something like, 'Going to San Diego' and then I'll hash-tag 'Playing for Kennedy.'" It is really impressive to watch these young players, guys who have generally been blessed with excellent health and God-given abilities, interact with the young -- sometimes painfully young -- patients they encounter at Rady. Some of the kids these guys talked to today are terminally ill, although you wouldn't know it when they finally warm-up to these high school baseball players. Jan Hernandez, a top Puerto Rican infield prospect, was called over to interact with a very young patient whose parents primarily spoke Spanish. The child was reluctant to acknowledge Jan at first -- it was reminiscent of a year ago when 2011 PG All-American Carlos Correa, the No. 1 overall pick in June's MLB amateur draft, was in this very courtyard and brought smiles to another young Spanish-speaking patient -- but Jan worked his magic. Soon the child was swinging a big plastic bat at balls tossed by Hernandez, albeit with the gentle help of a loving father. "This is the best experience of my life; the children, they're awesome," Hernandez said in somewhat halting English. "This is very special for me and for the children and all the guys here. It is the best moments, the smiles on the kids (and) it's a special feeling right now." All-American right-hander Jared Brasher from Pell City, Ala., also spent most of the half-hour or so he was in the courtyard with one patient, and felt like he had made a new friend. "This was really exciting to meet these kids and maybe help (them smile) a little bit," Brasher said. "They don't usually get the chance to come out here and see baseball players like us and it's just important to try to give something back. It just feels really good. "It makes me real thankful for what God gave me," he said. "I get to go out and play baseball and these kids have never really gotten that chance." When the young patient with whom Brasher had spent so much time with was taken away, she began to cry. That, too, stopped him in his tracks. "She got kind of upset when she was leaving," he said. Former San Diego Padres All-Star closer Trevor Hoffman is the Perfect Game All-American Classic presented by Rawlings Honorary Chairman for the second straight year, and he, too, was at Rady Children's Hospital Friday afternoon. Since retiring from the game in 2010, Hoffman and his wife, Tracy, have remained in San Diego and have worked tirelessly in fund-raising efforts for Rady. "To have first-hand knowledge and to be able to walk up to a child battling some serious health issues, and to peel away your baseball uniform, peel away your baseball-player hat that you wear a lot of the time and to kind of get down and dirty with these kids and have a conversation with them (is special)," Hoffman said of the All-American's visit. "Just to let (the children) know that what they're doing -- whether it's drawing on some paper or reading a book -- and just kind of take their minds away from the trials and tribulations of what they have to deal with here, it's great for these young athletes to get exposed to that type of situation." Ciuffo has been exposed to these situations. And a visit to a hospital more than 2,000 miles from home took him back home for an afternoon. "It makes me get a little bit choked-up sometimes," he said. "These kids, they're awesome. They didn't do anything wrong and they didn't deserve any of this that's happening to them right now, and it's just so sad to see everything that they're going to have to go through. "This and the Kennedy thing, it's all kind of brought me to think, you know, if something doesn't go my way or if I get mad, it's really not all that bad," Ciuffo said. "My life is going pretty good right now." AFTER THE VISIT TO RADY, the All-Americans spent an hour-and-a-half at the Marine Corps Air Base Miramar checking out first-hand a Marine Corp helicopter; a cargo, troop and re-fueling plane and an F-15 fighter jet up close and personal. There was also a walk up six flights of stairs to the top of the control tower -- the view of the airfield from the tower was breath-taking after those of us in the older crowd had time to catch our breath. 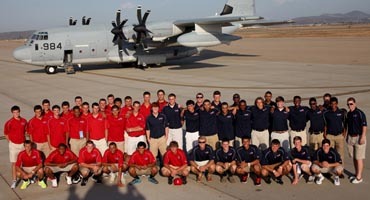 The All-Americans were once again engaging -- just as they had been at Rady -- asking the pilots, crew chiefs, mechanics and other Marine personnel all the right questions. The Marines were impressive and professional, and very eager to accommodate the PG-All Americans, who in many cases couldn't have been more than a year or two younger than the military personnel that were explaining how in-flight re-fueling of an F-15 fighter-jet takes place. It was hard to choose between who was more impressive during the stop at the base: the Marines and their obvious professionalism and sense of duty or the PG All-Americans that showed maturity and an eagerness to learn. Well done on both fronts. To view more photos from the Perfect Game All-Americans' visit to Rady Children's Hospital and the Miramar Marine Base, be sure to visit the event's Flickr page. There was no one who arrived later or went to work earlier as far as the pre-game on-field activities go at the Perfect Game All-American Classic presented by Rawlings than the young man from the Dominican Republican. Fifteen-year-old right-hander Mayky Perez -- the first native Dominican prospect to play in the Classic in its 10-year history -- didn't arrive in San Diego until 1:30 a.m. Saturday after a full day of travel on Friday from his home in San Pedro de Macoris, D.R. PG All American Classic East Team head coach Clyde Metcalf immediately sent Perez out to the mound to pitch the first inning of the PG All-American Classic East-West scrimmage game at Point Loma Nazarene University and the 15-year-old's fastball hit 90 mph very early in his one-inning outing. It was an impressive performance by a young man who is being asked to do a lot of growing up in a hurry. This is the first time that Mayky (pronounced "mikey") has left his homeland, and the thought occurred to me that the teenager must have felt some trepidation at making such a long journey to a foreign land all by himself. This wasn't like flying to Miami or Fort Myers, where so many other Dominicans get their first taste of America. This is the West Coast, the Pacific Coast, and the 15-year-old Perez -- who speaks no English --spent 11 hours by himself either in the air or in airports. He insisted, however -- speaking through East Team assistant coach Manny Hermosillo -- that was not the case. "I was waiting for this and I was ready (to make the trip)," he said, intent on not wasting any energy with long replies to a nosy reporter's questions. When asked through Hermosillo if he felt a sense of pride at being the first Dominican to be selected to play at the Classic, he was again pretty straight-forward. "This is very special. I never thought I'd be here," Perez said, "but I was selected and I'm ready to go forward." Perez -- listed at 6-foot-4, 195-pounds but appears to be a little more slight than that -- said he started playing baseball as an 8- or 9-year-old, and at age 12 was selected to play in the premier Dominican Prospect League with league co-founders Brian Mejia and Ulises Cabrera. A scouting report on the DPL website describes Perez as "physically impressive (with an) XL frame, long limbs (and) athletic body with muscle tone. ... He pounds the strike zone and is not afraid to go after hitters. ... He has natural downhill life with occasional 2-seam life down in the zone to RHH ... and come July 2nd, 2013 Mayky will undoubtedly be one of the best arms in Latin America." Hermosillo coaches at Montgomery High School in the South Bay here in the San Diego area. He was made an assistant coach for the East Team just so he could chaperone Perez, provide him with rides to and from the airport and also help him communicate with his teammates and others, like myself, who wished to speak to the young prospect. Perez is rooming with Puerto Rican native Jan Hernandez, who is also serviceably bilingual, during his stay in San Diego. We're happy to have New Era, the official cap of Perfect Game, on board for this year's Classic. 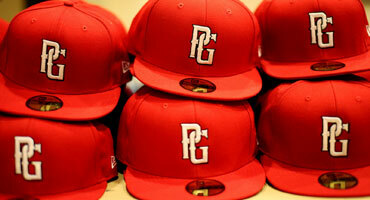 Nothing beats a fitted 5950 cap as the Perfect Game All-Americans rock the PG. New Era on Facebook. New Era on Twitter @New_Era_Caps. • Clint Frazier continues to show impressive five-tool ability, taking a BP session that one PG scout labeled as "ridiculous." Frazier was the runner-up at the National Showcase's Rawlings Home Run Challenge in mid-June as he continually pelted the seats in left-center field at the Metrodome with long balls. Here at Point Loma Nazarene he did much of the same, and hit 24 long balls during his junior year in high school. • Rowdy Tellez' power potential is nearly unmatched. Even among this group of the best baseball players from across the country, Tellez stands out with his tall, hulking build, and launched several balls well out of Carroll B. Land Stadium. Tellez out-slugged Frazier to claim the Rawlings Home Run Challenge at the National Showcase as mentioned above, routinely depositing balls into the upper deck of the Metrodome. • Dominic Smith also continues to show why he is one of, if not the best overall hitter in the 2013 class with a very impressive BP session of his own. Smith consistently hits everything hard, smacking line drives to all parts of the park with a clean, fluid stroke. • Mayky Perez, the first Dominican player to every participate in the Classic, took the mound to start the scrimmage for the East squad. Perez, who is 15-years old, looked sharp, sitting at 89-90 with his fastball while working a 1-2-3 first. With a strong, tall build, it's easy to envision Perez throwing much harder more consistently in the not-so-distant future, especially given his age, and he'll likely be the most sought after player during next summer's international signing period. • Josh Hart led off the bottom of the 1st inning with a single off of West starter Jonah Wesely. Hart is an on-base machine that uses his tool-set perfectly as a prototypical leadoff threat. Wesely touched 91 in this game, retiring the side in order after Hart reached. • Nick Banks hit a hard single in the top of the 2nd for the West. • Primary infielder Travis Demeritte worked a couple of innings for the East, throwing almost exclusively 91 mph fastballs. Demeritte is one of the best defensive third basemen in his class, and also shows promising power potential at the plate. • Chris Rivera, also a primary infielder, also worked a pair of innings for the West while throwing 90-91 mph fastballs. East shortstop Oscar Mercado did manage to hit a single off of Rivera. • Rivera also showed his prowess at the plate by hitting a deep fly to the warning track. • West RHP/1B Derik Beauprez also hit a booming fly that was caught by East outfielder Justin Williams. Williams looked particularly good tracking Beauprez' fly off the bat to run it down. • Another primary infielder, Jan Hernandez, also took the mound for the East. Hernandez sat in the upper-80s, but like Demeritte and Rivera, his future is as a positional prospect. Hernandez is the second player from Puerto Rico to be named to the Classic, following last year's Rawlings Defensive Player of the Year and the 2012 No. 1 overall pick, Carlos Correa. • After his impressive showing in batting practice, Dominic Smith also took the mound, working with his usual low-90s fastball. Demeritte, Rivera, Hernandez and Smith were all turned to pitch in an attempt to not wear down the primary pitchers in attendance, although Demerrite, Rivera and Smith all have legitimate upside as pitchers. • John Sternagel hit a walk-off single in the bottom of the fourth inning to break a scoreless tie. Travis Demeritte scored the winning run, giving the East the 1-0 edge in the four inning scrimmage. The players are now off to lunch and will visit the Rady Children's Hospital and Marine Air Station Miramar this afternoon. Domingo Ayala's "official" Perfect Game prospect profile reveals some interesting numbers. His fastball has "reportedly" touched 138 mph, and he has an outfield throw of 120, an infield throw of 115 and a catcher's throw of 100. He has run a 5.70 60-yard dash and recorded a 1.58 Pop time. Ayala, a "reported" top prospect from the Dominican Republic, was at the Perfect Game All-American Classic presented by Rawlings practice and scrimmage at Point Loma Nazarene University Friday morning, and after I looked at those numbers, I decided to ask him what he felt his greatest strength as a ballplayer is. He was quick on the draw. "I would say of the tools, my strongest one is hitting for average or hitting for power, or maybe arm strength, or maybe speed, or maybe defense," Ayala said without flinching. "One of those is probably my strength, but I think another factor is that I'm probably just one of the greatest all-around players." Ayala, who will act as an assistant coach for both the East and West squads at Sunday's PG All-American Classic at PETCO Park in downtown San Diego, has been posting humorous baseball "instructional" videos on YouTube in recent months and has become a popular figure. He insists he's playing with prospects his own age while enjoying the PG All-American Classic festivities, and the young players certainly enjoy his company. "When I was 7 years old I had a batting instructor that I went to every week, and I worked every day, hours a day, hours a day, hours a day. By the time I was 14 years old, I'm his batting instructor now." When Ayala first arrived at Carroll B. Land field at Point Loma Nazarene Friday morning, he made a point of introducing himself to each of the nearly 50 scouts in attendance individually. He took part in a batting practice and infield session with the West Team players, and while standing outside the batting cage started up a conversation with West infielder Christopher Rivera. He told Rivera he was taking his place on the roster, asked Rivera for his jersey and then told the top prospect from Fullerton, Calif., he should go out by the foul pole and pull weeds. There was a great deal of laughter all around. "It seems like a good group of guys and it's a good production (Perfect Game) puts on and I'm excited to play in front of a lot of scouts and a lot of people," Ayala told me. "Since I found out I was going to be a part of it, it has been exciting. I wasn't sure because I thought maybe I would have signed a contract by now and I would be playing in the big leagues, but the contract negotiations are still going on. "These guys gave the opportunity to come out to a great event like this, and once they said I was the 49th guy, I say this is going to be fine," he continued. "I get to play with guys my age, finally, and I think it will be a good experience. "The large contingent of scouts don't intimidate Domingo. While he insists he has already been well-scouted, he told m it's impossible to get too much exposure in front of the scouts. "I think they all have the scouting report, and it's something good, but it's good to show them again so they know that it's not just a fluke the first 100 times they see me," he said. "The 101st time they can say, 'OK, maybe he's for real this time.' My whole preparation is for the scouts, so when I'm here I'm ready for it." Ayala also hopes to continue a relationship with Perfect Game, thinking the arrangement can be mutually beneficial. "Perfect Game is a great place for a lot of kids to get started, so I think it helps me out," Ayala said. "I think having the greatest talent (among) the 17, 18 years old especially at this game, to put me there is a good thing for them. "I want to teach the kids and that's why I put them up," he said of the YouTube videos. "But at the same time it got me exposure so that now the scouts know who I am, the kids know who I am and it's (made) a name for myself." Domingo Ayala has made a name for himself, and has provided a lot of enjoyment all along the way. 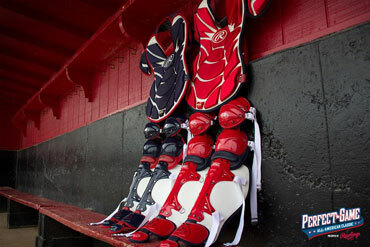 Yesterday I shared a picture from Rawlings of the catcher's gear the players will be wearing at this year's classic. Above is a shot of the cleats the players will be wearing on the field. Thanks to our new partner, New Balance, for providing these sharp looking shoes. 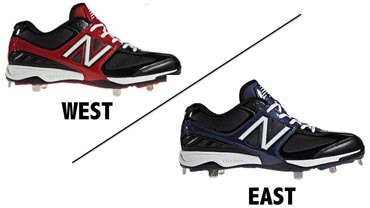 Show your support by giving New Balance Baseball a follow on both Facebook and Twitter @NB_Baseball. Teams arrive at Point Loma Nazarene U. The teams' bus piloted by the lovely and friendly Caroline pulled off of Catalina Boulevard and drove onto the campus of Point Loma Nazarene University. Despite an overcast sky and heavy fog, it was certainly difficult to miss the main attraction. That would be, of course, the Pacific Ocean. The scoreboard in right-center field -- flanked by palm trees -- declares Carroll B. Land stadium "America's Most Scenic Ballpark." As we waited for the fog to clear, no one could offer any kind of argument.The teams were greeted at the ballpark by about a half-dozen autograph seekers -- a couple of them annual visitors -- and more than 40 scouts. The teams were scheduled to take part in an hour-long practice session and two-hour scrimmage before leaving for visits to Rady Children's Hospital and Marine Corp Air Station Miramar. PG prez Ford issues mandate: have "a lot of fun"
The 48 prospects that will participate in Sunday's Perfect Game All-American Classic presented by Rawlings were gathered together Thursday evening in a banquet room at the San Diego Marriott Mission Valley hotel for what is formally called the Welcome Orientation Dinner & Media Training. Those 48 players -- and a surprise "49th prospect" who was introduced shortly after everyone had finished an excellent meal of grilled sea bass and steak, roasted red potatoes, a couple of hot and cold rice dishes, salad and dinner rolls -- heard from several people who work behind the scenes at the event about expectations, protocol and, most significantly, what the 10th annual PG All-American Classic is really all about. PG President and Founder Jerry Ford delivered those "Meaning of the Event" words to the intently focused young ballplayers when he spoke of their much-anticipated visit to Rady Children's Hospital on Friday afternoon. "The most important thing that is going to take place this week is not the baseball game," Ford told the gathering. "We're here for a reason and that reason is to continue the fight against childhood cancer. "That said, the game is very important, and the main thing that I'd like everybody to leave here with is just that they understand they had an enjoyable week here and really had a lot of fun," he continued, "because in the end, that's what baseball is really all about; having a lot of fun." Proceeds from the Perfect Game All-American Classic presented by Rawlings go directly to the Rady children's cancer care unit. Ford also announced Thursday night the recipients of seven awards from June's Perfect Game National Showcase. All seven recipients are PG All-Americans and were in attendance to receive their awards: Austin Meadows, Fastest Man; Robbie Telez, Top Power Hitter; Reese McGuire, Top Defensive Player; Robert Kaminsky, Top Pitcher; Cavan Biggio, Top Hitter; Dominic Smith, Most Valuable Player (two-way prospect); and Clint Frazier, Top Overall Prospect. The prospects also heard from Jesse Lovejoy, the public relations contact at the San Diego Hall of Champions who is acting as the PG All-American Classic media relations person. He spoke to the young guys about proper protocol when dealing with the media and doing interviews, while adding that "I'm always amazed with how well-spoken you guys are and how seriously you take the things like what we're doing tomorrow." He also laid down the law about social media, a.k.a. Twitter and Facebook. Their use is encouraged with the caveat that everything that is posted is positive in nature and nothing is overtly negative. Phones and the use of any social media will also be prohibited during the practice and scrimmage sessions, during the visit to Rady and during the All-American Classic itself. "No phones, period," Lovejoy said. "Don't get them out, I don't want to see them (and) the coaches aren't going to want to see them, I can guarantee you that. Be focused on what you're doing at the time." Seems like a pretty common-sense approach to me, but I understand that 16- and 17-year-olds need to be reminded of proper etiquette from time-to-time. The kids that are here are the best of the best, not only on the field but usually in the classroom and most social settings as well. There is seldom, if ever, reason to be concerned about rule-breakers. The surprise "49th prospect" introduced Thursday night, by the way, was none other than YouTube sensation Domingo Ayala, whose endeavors I will outline in more detail on Friday. The day begins with a players and coaches breakfast at 7:30 a.m. and won't conclude until almost 10 p.m., but you can bet most of the guys will follow Ford's advice and end up having "a lot of fun." The final players to register for the PG All-American Classic presented by Rawlings made their way through the registration line late Thursday afternoon with many of them coming down from Long Beach after spending last week at the Area Code Games. Most of the Classic prospects arrived in time to attend the Welcome Dinner, despite heavy traffic congestion compounded by a 5 p.m. (PDT) Green Bay Packers-San Diego Chargers preseason NFL game at Qualcomm Stadium probably not more than a half-mile from the Marriott Mission Valley hotel. I ran into standout Cedar Rapids, Iowa, left-hander/first baseman A.J. Puk and his father, Dr. David Puk, as they entered the registration room, and Dr. Puk seemed exasperated by the Southern California traffic until he started talking about A.J. 's performance at the Area Code Games. Dr. Puk's humble praise of his son's work-week in Long Beach got me thinking I should take a closer look. Sure enough, PG National Director of Scouting David Rawnsley used several blog posts to speak glowingly about Puk's performance at the Area Codes, both as a pitcher and a hitter. The U. of Florida commit had his fastball touch 92 for the first time and he continued a summer during which he has just flat-out raked at the plate. "LHP A.J. Puk better watch out or scouts are going to think he's a big-time hitting prospect as well," Rawnsley wrote in his scouting blog. "He singled up the middle off (PG All-American) Ian Clarkin after Clarkin had struck out four of the first five hitters. (Puk has) really been swinging the bat well this summer and there is no question he could be a 2-way player at Florida if he makes it to college. Here's a glimpse at the catcher's gear to be worn in Sunday's game. Thanks to our presenting sponsor Rawlings for providing the gear, uniforms, bats, balls, and so much more. Be sure to check out Rawlings on Facebook, and give them a follow @RawlingsSports. Baseball card collecting has been an on-going pursuit of kids, hobbyists and serious collectors since the turn of the 20th century, and it doesn't appear its popularity will be on the wane anytime soon. That's clearly evident when you observe the pure sense of satisfaction on the faces of the PG All-American Classic presented by Rawlings' prospects when they have their photos taken by the Topps Baseball Company for use on what will be their 2012 PG All-American Classic collectors' cards. I was able to watch several shoots late Thursday morning and into the afternoon. Topps has been involved with the PG/Aflac All-American Classic since 2006 and has produced thousands of cards. Just imagine how cool it would be to have in your possession the Topps 2006 Aflac All-American Classic Jason Heyward card or the Topps 2007 Aflac All-American Classic Eric Hosmer card. They're both out there, undoubtedly on sale on e-Bay or some other outlet. And who's to say that in the next few years the public won't be clamoring for a Topps 2011 Perfect Game All-American Classic Carlos Correa card or a Topps 2012 PG All-American Classic Clint Frazier card. Get ready to stand in line. Topps assistant brand manager Alex Novick said Thursday that the Classic players really seem to enjoy the five-minutes it takes for them to complete their photo shoot. That enjoyment was certainly evident to me. "From what we hear from them, this is their first baseball card," Novick said. "They get it back and they're all jazzed-up to read the card-backs, and read the bio that we write about them, and see themselves in their uniforms holding the bats or holding the gloves." Each player gets his own set of cards -- which are produced virtually overnight -- and there is an autograph session late Saturday afternoon in which they sign each card. "They're never too excited about sitting down and signing 250 autographs all at once, but they can give them to their friends and family, and they're always excited about getting their own set. So I do they think they enjoy (the experience)," Novick said. "That was cool. I liked it a lot," top Colorado outfield prospect Derik Beauprez said after his shoot. And let's face it, it's an endeavor that would seem to benefit everyone down the line. "Our brand Bowman (Baseball) is all about the top young, amateur players and minor league players in the country, and it's all about getting the guys (on cards) before they become big -- it's getting in on the ground floor," Novick said. "It's definitely important for us to be here and see the young talent and make cards for them, and hopefully (these cards) will be a part of our products when (the players) get drafted and have value." While each player gets his own set of cards, Topps sits on sets of its own. The company doesn't have the right to use them until a player turns professional and even then the player must sign an agreement with Topps approving their use. Once a player signs professionally and agrees to allow Topps to distribute the cards, they will be inserted into certain product packages as additional bonus hits. Novick said they have value because they are a player's first autographed cards. He also said Topps and the Bowman brand are set to enjoy a long relationship with the Perfect Game All-American Classic. "It really fits perfectly with Bowman's theme of getting on the ground floor with players when they first come up," he said. "It's something that we really like to be involved with ... so there are definitely a lot of marketing possibilities." 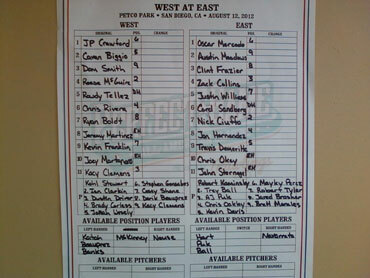 It came as absolutely no surprise to me that the first 2012 Perfect Game All-American Classic presented by Rawlings top prospect to register for the event at 10:35 a.m. Thursday was East Team hard-throwing right-hander Kevin Davis, an East Cobb Brave from Brewton, Ala. This is the reason I wasn't really surprised: When I first spoke with Kevin after he enjoyed a sensational outing for the Braves at the 17u Perfect Game World Series in Peoria, Ariz., late last month, I asked him if he was looking forward to participating in the PG All-American Classic. "That is going to be amazing," Davis said to start his reply, letting the words roll of his tongue in that soft Alabama drawl. "You've got the best players in the country on one field, competing against each other; it can't get any better that that." And then, without hardly taking a breath, the words kept coming and the excitement in his voice kept building. "It's going to be a lot of fun," he said, almost beginning to ramble. "Pressure has never really got to me, and you're going to go out there and you've got one inning and you try to get three outs. It's just like coming into a game and closing, and it's the same aspect. I've closed before, and it's the same deal; you come in for one inning and get three outs. The adrenaline is going to be rushing and everybody's going to be throwing hard, and you still just have to get three outs." I could tell even then that Davis couldn't wait to get to San Diego, so when he was the first one to show up there was no surprise whatsoever. He casually walked through the whole registering drill, signing posters, baseballs and bats before getting fitted for his uniform. He was already finished with his Topps baseball card photo shoot and on his way to his way to his room at the San Diego Marriott Mission Valley hotel with his bag full of new gear before the next player entered the registration room. 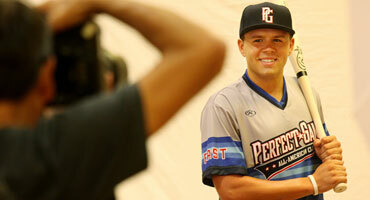 That second player was Cherry Hills (Co.) first baseman Derik Beauprez, who will play on the West Team at the Classic. Beauprez is a young man I had an opportunity to speak with at the PG Rocky Mountain Showcase at Cherry Creek High School over the Memorial Day weekend, but he hadn't been selected to play at the PG A-A Classic at that time, so I hadn't had a chance to ask him his impressions. "I'm really excited about this," Beauprez said after trying on his game-day uniform. "I just hope I can come out (for the game) relaxed and not put too much pressure on myself." Maybe he needs to talk to Davis about pressure. The PG All-American Classic presented by Rawlings is about much more than the game, of course, and that fact isn't loss on the young prospects. Saturday afternoon's schedule includes trips to the Rady Children's Hospital cancer center where the players will be given the opportunity to interact with the young patients, and also to the Marine Corps Air Station Miramar, which was a big hit last year. But it is the hospital visit that always leaves the biggest impression on these young men, and the new guys coming in seem to know and appreciate the Classic's history. "I think it's awesome that we get to go to the Children's Hospital and get to see those children," Beauprez said. Many prospects show up for the registration by themselves or with teammates, and others show up with one or both of their parents. Englewood Hills, N.J., left-hander Robert Kaminsky -- whose mid-90s fastball would be enough to earn him the nickname "Rapid Robert" if it hadn't already been claimed by Bob Feller -- fit into the latter group and was accompanied by his father, Alan. It was difficult to determine who was more excited, Robert or Alan, as dad used his cell phone to snap off several photos of Robert at each step of the check-in process. "This is a dream come true," Alan said. "This has just been so exciting and so terrific; everybody's been wonderful and Robert's just having the time of his life. Our family is so proud of him and everything he's accomplished, and Perfect Game has been so good to him. It's just been great (and) it's every kid's dream come true." Robert's mother, Donna, and sister, Anna, also made the cross-country trip from New Jersey to be here, as did "a bunch" of Robert's closest friends from St. Joseph High School. "They all came out from New Jersey and these have been his friends since grade school," Alan related. "They're just great friends and supporters and it's all just very exciting." Robert is yet to make a college choice and as the country's No. 4-ranked national prospect he can afford to be picky. He has shown interest in Florida State, Florida, North Carolina and Virginia -- kind of hard to go wrong with any of those. While this is listed below, I wanted to point out again given a few inquiries from scouts that the full schedule for baseball-related activities for the 2012 Perfect Game All-American Classic presented by Rawlings can be found here. Included on that page is the schedule for the 2012 PG National Games which will be conducted the two days after the Classic, Monday and Tuesday August 13 and 14. This year's PG National Games will be held at the University of California San Diego's Triton Ballpark (Google Maps are also included on that page). The PG National Games is an annual event held in conjunction with the Classic to showcase some of the very best players in future graduating classes. Last year, 13 of this year's All-Americans (Ian Clarkin, John Paul Crawford, Travis Demeritte, Stephen Gonsalves, Josh Hart, Gosuke Katoh, Reese McGuire, Oscar Mercado, Chris Oakley, A.J. Puk, Dominic Smith, John Sternagel and Jonah Wesely) participated, and 11 of those were named to the event's top prospect list. In other words, this year's PG National Games will serve as a preview of some of the players we can expect to see in next year's Classic. Follow this link to read a more detailed preview. The Jackie Robinson Award, named for the late Major League Baseball Hall of Famer and former Brooklyn Dodger, is awarded annually to the Perfect Game National Player of the Year – the All-American considered the nation’s top high school prospect. The award is presented to the player who exhibits outstanding character, leadership, is involved in his community and embodies the values of being a student-athlete. The first recipient of the award was Justin Upton in 2004, the second year of the Classic. Lance McCullers, now a member of the Houston Astros organization, received the honor last year. Welcome to the Perfect Game All-American Classic presented by Rawlings blog, and congratulations to all of the players, friends and family members involved with the Classic. Visit the Roster page to access the individual player profiles, as well as the History page to learn more about the previous eight games played since the inaugural event in 2003. The Scout page provides the daily schedule of baseball-related activities, including those for the 2012 PG National Games. And of course, don't forget to tune into CBS Sports (channel 613 for DirecTV subscribers) at 6:00 pm PDT on Sunday for the game itself.